Mobile home on 1.11 acres for sale in St. Regis, Montana. This could be a commercial or residential lot! The parcel has an older mobile home that is currently being rented. Store your recreational toys in one of the two large shops. Property has 400 feet of Highway 135 frontage. There is also St. Regis sewer hook ups, an artesian well and 3 phase power is close to property! Perfect opportunity for a business to get busy Highway 135 exposure!! Enjoy the quick routes to Glacier Park, Lolo Hot Springs, Flathead Lake, Clark Fork River, St. Regis River, and the Trestle Creek Golf Course. 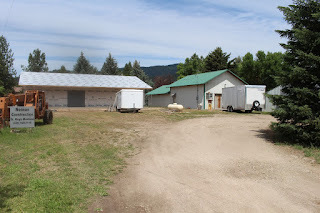 Only 20 minutes to Look Out Ski Area and walking distance to the Clark Fork River boat launch. Live and work in this western Montana friendly town. If you have any questions or would like to set up a showing please call Judy Stang at 406-822-2316. Priced at $279,000.